What a busy few weeks. There have been work and personal engagements, planning for a wedding, and my sister just moved in with us for a month or two. I have still been cooking as usual, but haven’t had time to document as much as I’d like. I also need to add getting in shape to my list, because it’s crunch time (pun intended, love puns) with only a month and a half to go until our big day. I just signed up for CrossFit and a few boxing classes. I let you know how all that goes. I think I have fairly healthy eating habits, but Dustin and I both have trouble resisting our sweet tooth. 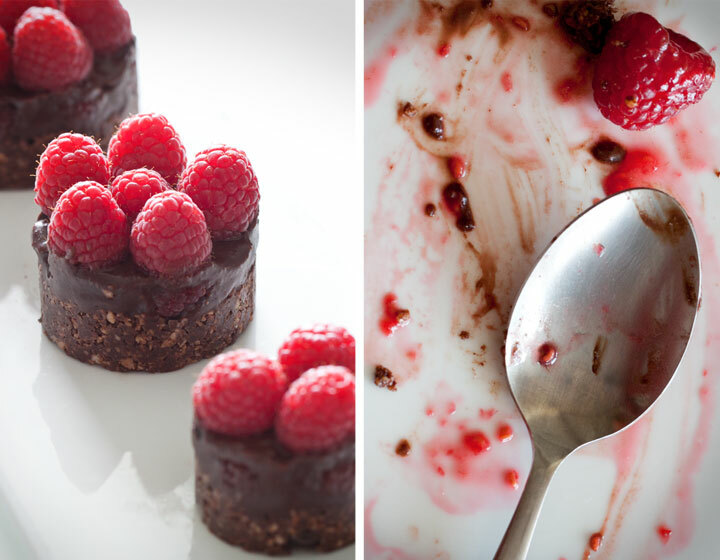 Last week I was really craving something decadent, but didn’t want the guilt afterwards, so I decided to make a raw chocolate cake with raspberries. A lot of raw recipes use nuts of some type as a base. 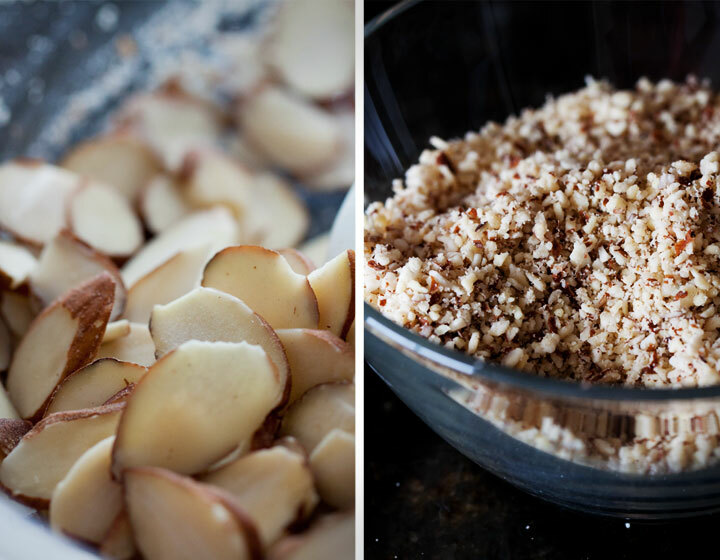 You start this recipe by grinding 1/2 cup of almonds in a food processor. In our pre-processor days, I would grind the almonds in a plastic bag by hitting them with a blunt object. I do not recommend that method! I combined the ground almonds with 2 Tablespoons Cacao, 1 Tablespoon agave, and 1 Tablespoon coconut oil. As you mix all the ingredients, the agave and coconut oil help the mixture stick together. For that reason, agave and coconut oil are staple ingredients in many raw desserts. Pat this mixture into a 2 -3 inch mold to make a perfect circle. Make sure to apply some pressure so it creates a solid base. This will be the crust for the cake. I used a little coconut oil on the metal molds so the crust wouldn’t stick. Keep the crust in the mold for now so the next ingredients layer up nicely. Place fresh raspberries on top of the crust. Next is the most important part, the chocolate topping. 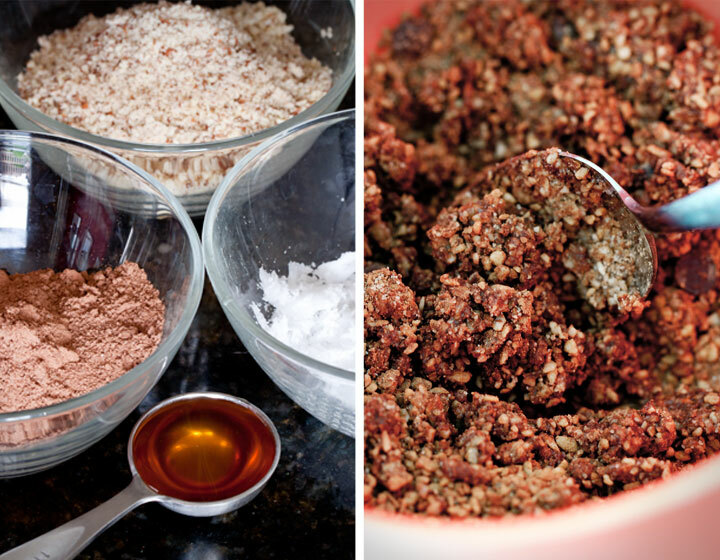 Whisk 1/2 cup cacao powder, 1/2 cup agave and 1/4 cup coconut oil. The mixture isn’t terribly fluffy, but will firm up once it’s in the refrigerator. 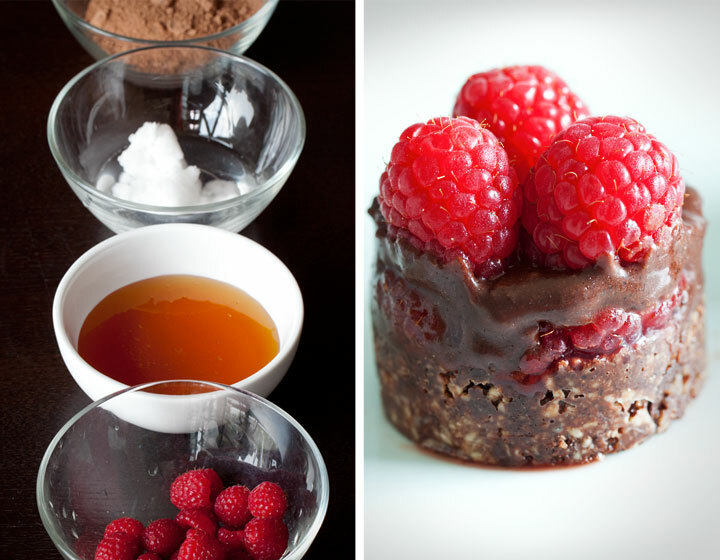 Drizzle the chocolate on top of the raspberries. It creates a very pretty mid layer. Then top with a few more raspberries finish things off. With the cakes still in the mold, put everything in the refrigerator for around 20-30 minutes. If they are still a little soft, then give them a bit more time. Dustin and I straight up devoured every single bite. Part of me wondered how something so good could still be (mostly!) healthy for me, but there is no disputing the ingredient list. With our sweet tooth completely satisfied and our bellies full, we decided to reward ourselves again with a Sunday afternoon nap. It was a good day. 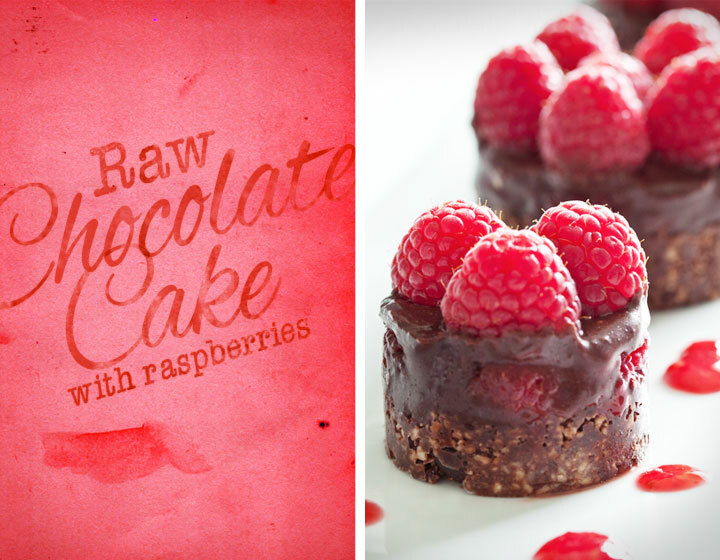 § 12 Responses to Raw Chocolate Cake with Raspberries"
What a pretty little dessert, so dainty! You did a great job in your photography. I love the lighting. I can see the little fuzz on the raspberries. Thank you! I’m enjoying learning more and more about the camera. I think I may even like taking pictures a tiny bit more than cooking. Looks delicious! My sweet tooth would be satisfied. I love almonds. How many calories? I’d say it’s around 150-200 calories. Also depends on the size of the cake. I don’t feel too bad about the calories since it’s all healthy ingredients. The coconut oil almost looks as if it is in powder form. Where do you buy your coconut oil? I guess, I should look for it here. I never had a recipe call for it. There is always a first time. I get the coconut oil from whole foods. If you leave it out of the fridge it becomes a liquid. When it’s cold it solidifies, so what you are seeing is coconut oil shavings. I don’t use it very often, but it keeps well and can be used in place of regular cooking oil. I can’t have nuts right now, so I am going to try this recipe out with pumpkin seeds in their place. I just inherited a food processor from my sister, so I totally relate to the plastic bag/blunt object note Delicious photos! I imagine pumpkin seeds will work really well and have a crunch to it. I’ve also used a blender in place of a food processor. What a disaster to clean up. lovely! I am going to have to try these. Please do. We ate every little bit, but instead of feeling sick and sluggish like you would from eating processed sugar, we felt satisfied and energized. So… how many tartlets did you get out of these ingredients? I don´t have that small molds, but I´m gonna try to make a big cake out of it! Mmmmmhhh…. I made three tarts. 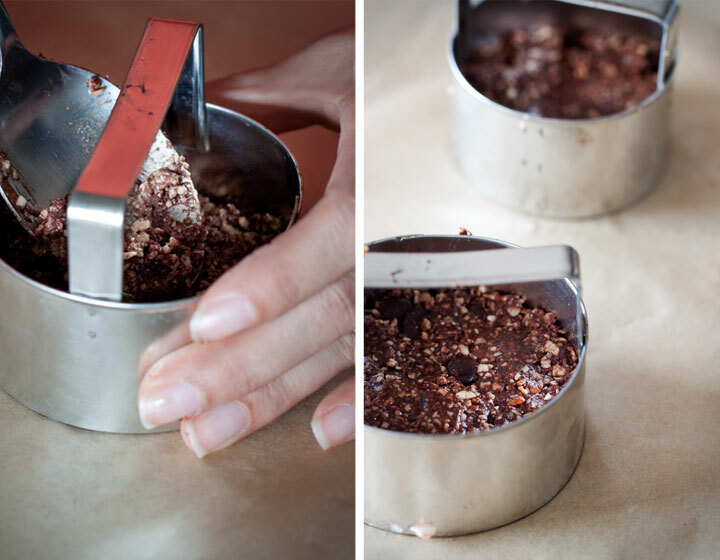 I recommend making a little extra if you are using a cake pan. It will make the cake easier to server if there is a sturdy foundation. Let me know how it goes!